Due to some severe allergies that run in our family, we had to try multiple formulas with both boys to figure out what would work for them. I always feel guilty about just tossing the empty formula cans, so I try to reuse them in whatever way I can. With Deeter’s allergies, we wound up going through every formula out there – meaning we had a ton of different size empty formula cans banging around the house. Get it – banging? Ummm, anyway… in honor of EJ’s obsession with all things drums, and since he loves his Uncle Joe’s drum set, I thought the week we talked about the letter D would be a perfect time to create a drum set out of the empty formula cans. A little bit of background – as I collected the formula cans, I would wash them out to be stored, and I also peeled the labels off of them. 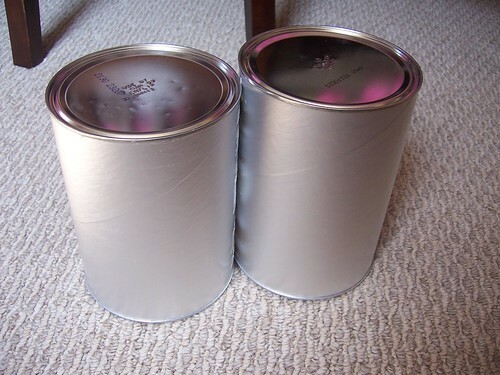 I thought about painting the cans as an activity with EJ, and I’m glad I tried it out first myself. 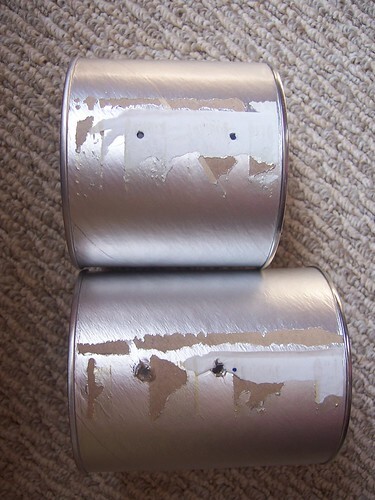 The smooth, silver paper that the formula cans are covered in are not suitable for painting – the paint scratches off very easily. As you can see in the picture to the left, I also tried to peel off the silver paper to expose the plain cardboard underneath. 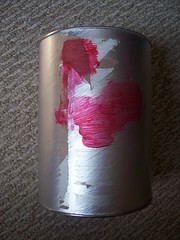 While the paint stuck very well to that surface, the silver paper was very difficult to remove. 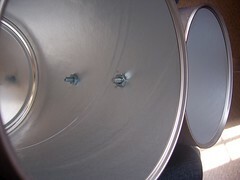 In the end, I decided plain silver drum sets were very cool. And we could decorate them with colored tape afterwards if we wanted to…. 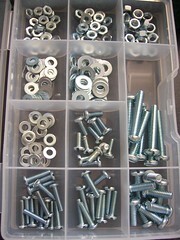 We had a case of “Assorted Screws and Nuts” laying around, which I thought would be perfect. The screws all have blunt ends so no little fingers could get poked. I also used an awl, two small screwdrivers, and some needle-nosed pliers from a tool kit we have. Measure out two holes vertically on the formula cans. You’ll need two holes so the drums don’t twist on only one screw. 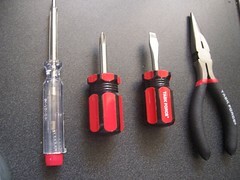 The top can in the picture above has the holes poked in with the awl, and the bottom picture shows the holes widened using one of the small screwdrivers – the holes are also closer together to attach to a short can. Using a short screw and a corresponding nut, attach two of the cans together, using a short screwdriver to tighten the screw while using the pliers to hold the nut still and do any final tightening as needed. Et voila! A fun and very loud drum set of two formula cans. 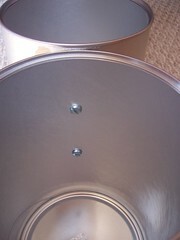 Now you are ready to attach other groups of two cans together to create a larger drum set. In which case, you undo all the screws and watch as the individual cans are played with loudly and separately. This has been a really hard week to get started for me. After coming back from the beach and taking Monday to recover from the trip, we got off to a slow start with the letter D. A lot of it has been my… ambivalence about the verse I picked. No, scratch that – it wasn’t the verse – it was the song that went with it from the Seeds Family Worship collection. I’m still wavering… I’m not sure I should be sticking to my plans to use verses exclusively from the CDs on this one. I still love the CDs, but I’m not feeling the song that goes with the verse… I’ll let you know what I’ve decided by the end of the week. For the letter D, we picked out things from EJ’s toys that started with the letter D. We picked out (from top left) a dog, a duck, a Dodge Charger, a dump truck, Darus the Dragon (EJ named him “Darus” a while ago – I have no idea where he got it from), a deer, two blinking duck eggs, and three dinosaurs. Once he got the hang of it, he was picking things out like a champ. The eggs were his idea – I honestly didn’t know they were duck eggs. At dinner, we also talked about other things in his life that start with the letter D. Two of the most important things… Daddy and Deeter (baby brother’s initials are DT, so Deeter has evolved into his nickname)! And a quick preview of tomorrow’s activity… D is for DRUMMING!!! If you haven’t heard Amanda’s good news already, please go over to her blog for her wonderful announcement! Comments Off on D is for dragging my feet. It’s the super, spectacular, stupendous, stellar and special…S! I love this verse for so many reasons. Three “s” words for one. But really because it says so much about Jesus. He is our Shepherd. Not just any shepherd. 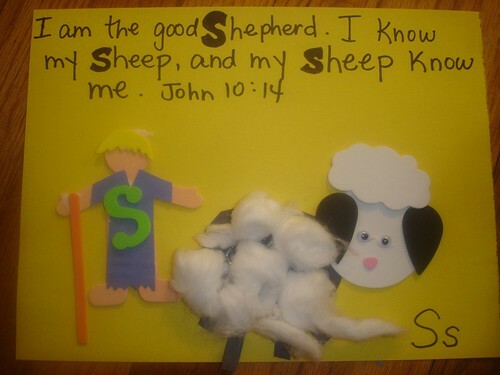 The GOOD shepherd. I so want Lydia to see Jesus as the one who loves her most and is always doing good for her. When my husband and I were in transition between jobs a few years ago, this whole section in John 10 really helped us. Jesus talks about how we know His voice and we won’t follow a stranger’s voice. This is a lesson worth learning at an early age–when we belong to Jesus, we’ll be able to tell the difference between His voice and the enemy’s. I like it!! OK, back to our super S craft. And then we needed a shepherd. 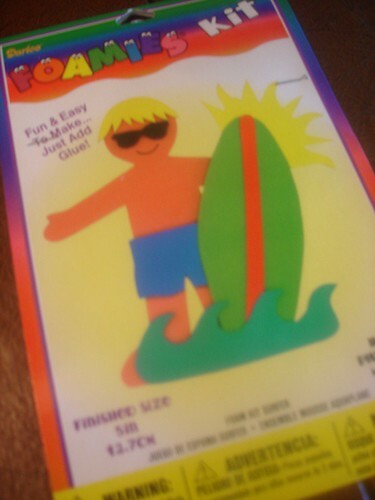 I had randomly picked up a surfer fun foam craft for like 12cents at Michael’s a few weeks ago. (We had a pool party with Lydia’s cousins and I wanted to make some summer-y crafts. Well, we never did. So, he’s been sitting in my “craft” closet waiting for the day we did the letter “s”.) But instead of a surfer, I figured he’d make a great shepherd! I also found a fun-foam “S” and I think it really adds to it. You know, kind of a “Super Shepherd” kinda thing. 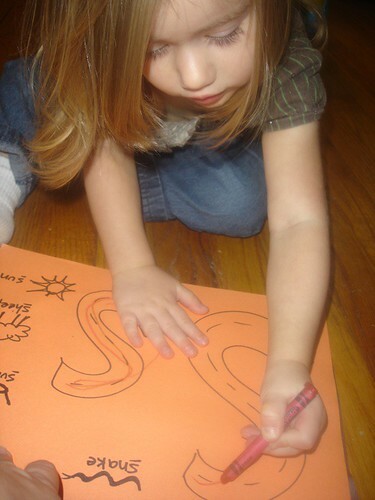 While we let that dry, I made a few S’s for Lydia to trace. Our printer is still jacked up and I still don’t have the patience to fix it, so I couldn’t print off the ones I usually do. She did the small S first and you can see she started making a circle. 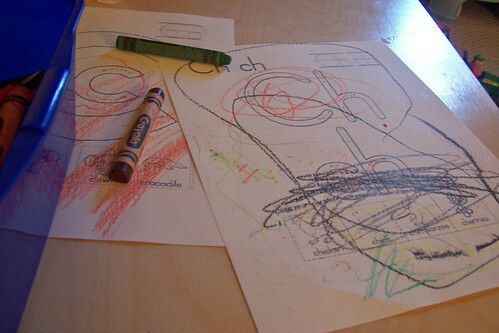 Then she went back and traced it perfectly. I was so impressed! The rest of our week is pretty packed, so I’m hoping we can do a little more for “s” than SCRUB the bathroom, STOP whining and STRAIGHTEN the bedrooms. 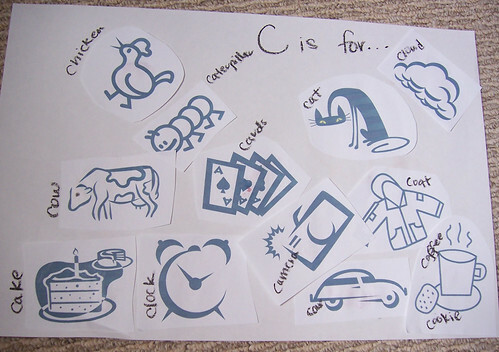 I think C can be a hard letter for a child to understand at times – it makes so many sounds. I’ve introduced 3 sounds of C to EJ… hard C as in cat, soft C as in centipede, and CH as in chocolate. I just couldn’t isolate them and only do the hard C at this time – who could do the letter C for a week and not mention chocolate? It would have to be a stronger person than I am. It’s a wonderful dreary-fall-is-thinking-about-coming kind of day here in Richmond, so we have hunkered down inside all day. We broke out the paint and painted some circle art! I am sure many others have done this out there in the world wide internets, but this is one I didn’t look up online at all. I’ve been collecting different sizes of bottle caps and jar lids for a while, and some different ideas have been kicking around in my head about how to use them. 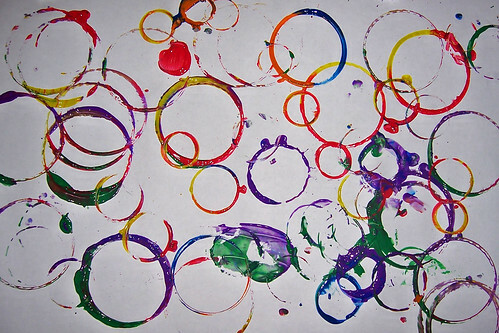 This one was as basic as they come – dip different sized round lids (or other circle items) into different color paints, and let the kiddo go crazy. We both had a good time with this one, and I love the finished artwork! We did a couple different ones to give to family members who love refrigerator-art. Since EJ has been reluctant to talk a lot about our weekly Bible verses, I’ve been thinking about some other things to do with them to help impress them into his heart. 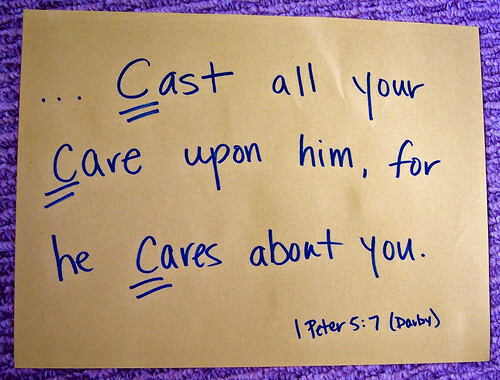 This week’s verse, “Cast all your care upon him, for he cares about you. ” (1 Peter 5:7) has a much better cadence to it than the others I’ve picked, and that helps us some. I also think I’m going to look through the different Seeds Family Worship CDsto see if there are any verses that they use for any songs that would fit well each week (ooo – I just found their website and they have memory aids and chord charts for each verse and song!!!). EJ loves these CDs (I love them, too! ), and they truly do plant the seeds of the Word into the hearts of children. EJ started singing along with the CDs before he was 18 months old. I hope that if I can make the verse of the week real to him in more than one way, it will help a lot. Do any of you have any advice in this area? I feel like I am prepared with crafts and letter activities, but when it comes to hiding the Word in EJ’s heart, I feel lost. Here are a couple more that start with C, too. Glue! EJ was so excited about this. 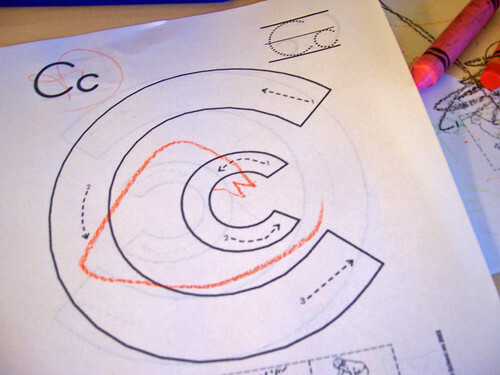 He kept asking for more C words… “What’s next?” I went with the glue stick to keep my nerves calm. Our verse for the week was picked out by Daddy. I was thinking about “Let the little children come to me,” or sticking with the first part of last week’s verse, “Children, obey your parents…” (we still need a lot of work on that one). But as I mentioned it last night, my husband recommended this one. Perfect. Lots of C’s, easy to repeat, and several important lessons to learn about God and our relationship with Him – all rolled into one verse! While the glue was out, we made a collage. I was thinking about another C-thing collage, but we’re heading to the beach on Thursday with EJ’s cousins (the adorable girls in the top right picture in the collage). We started talking about the beach during B week last week, and I thought we could continue with that. He got to use his glue stick and the scissors. He was thoroughly enjoying himself today. 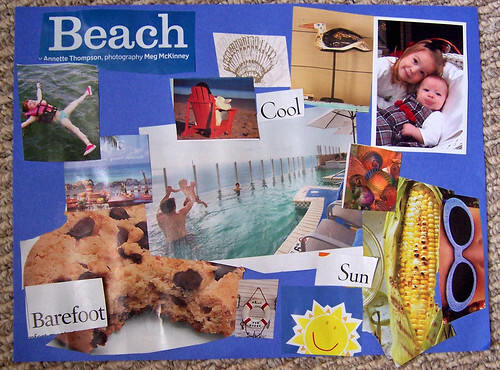 We talked through what was going on the collage as we picked out pictures from some of my summer magazines. And we picked out some C words, too. EJ actually picked out the corn and the chocolate chip cookie. Both may definitely make an appearance at the beach. And of course, the cousins’ picture made it into the collage, too. 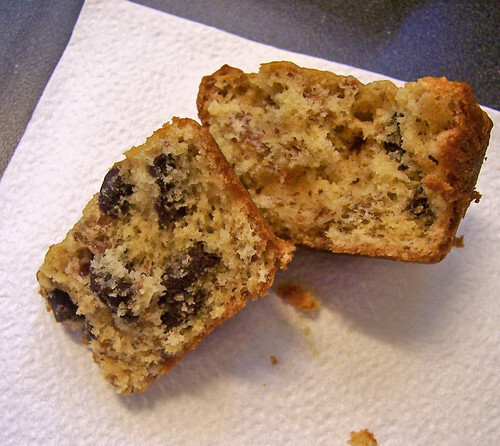 And for a snack… chocolate chunk muffins! We’re still on the letter “r” and have said our verse about 3000 times, we’ve read about Noah’s ark & his rainbow. We made rainbow bread. But I wanted to do a real rainbow craft. Most of the ones I found online were so sunday-school-ish and none of them really did anything for me. I was actually thinking about finding some prisms and just playing with those! But yesterday I needed to do the dishes. Not as in pack them in the dishwasher…but as in actually DO them. Because our dishwasher BROKE. I’m not happy about it. I can hardly keep up with a dishwasher, much less handwashing! So, I needed something to entertain Lydia while I attempted washing the dishes. I drew a rainbow on a piece of paper. I labeled each bow with the correct color (Roy G. Biv, you know?) then pulled out construction paper for each color. I ripped up some of it into squares (a la EJ’s letter “a”) and pulled out a little glue (I put it in a muffin cup with a qtip for spreading). I did one square of each color for Lydia. (As smart as she is, I didn’t think she’d be able to read it.) 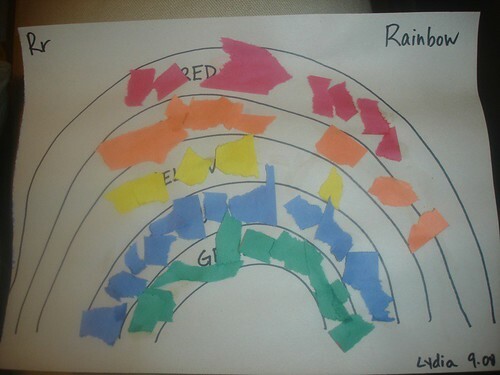 I told her to keep adding pieces of paper to the right color until the rainbow was all filled up. Then I stepped into the kitchen (merely feet from Lydia) to do the dishes. I was surprised. 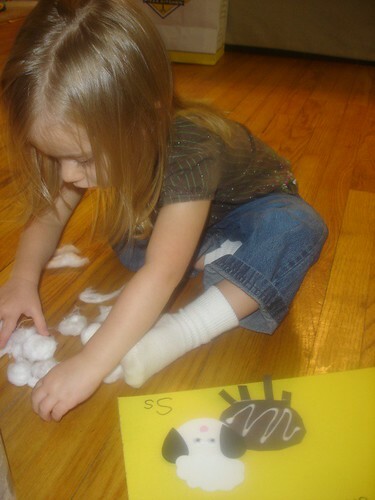 What 2 year old doesn’t want to play with glue and tear paper? I walked into the room and saw her rainbow. It had 2 giant pieces of paper glued to the rainbow. Not a small little square. She couldn’t tear them as small as I could. So, I sat down with her and tore enough paper for the whole rainbow. We took turns gluing squares onto our rainbow. She matched the colors perfectly and was enjoying every second. And that’s when I figured it out. It’s not about the craft. It’s not about the verse. Or the letter of the day. Or the “fun” I had planned for her. She certainly didn’t care about it. Lydia doesn’t want more stuff to do. She wants interaction and love and attention and affirmation from her Mommy. All these activities are just a vehicle impress my daughter. A way to show my daughter God’s love and His Word. There are times, of course, when she does art by herself. There are times she needs to do things alone and explore for herself. To become independent. 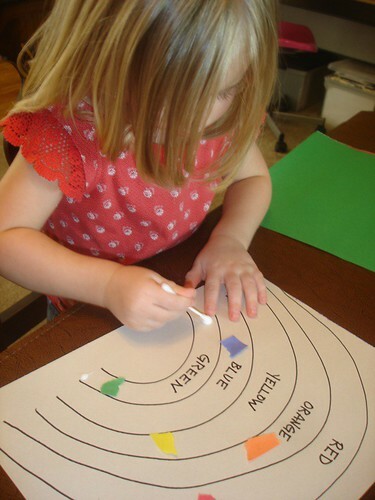 But our rainbow craft reminded me of what I really want. To impress my daughter—not with my housekeeping skills or my ability to multi-task or juggle several blogs—but to impress her with God’s love. I want the few hours we spend on God’s Word to be times Lydia remembers (at least in her subconscious!) as filled with love. And now I’ve got the perfect excuse to not to the dishes.